Description: The flowers are 1 inch (2.5 cm) across and have 5 fan-shaped, cupped petals and yellow to reddish anthers. 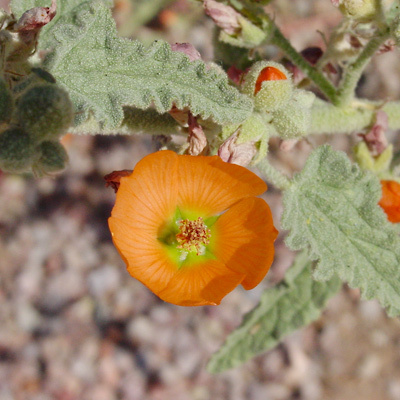 The flowers are typically orange, but can be other colors. The leaves have finely scalloped margins and are 3-lobed, alternate, greenish gray in color, covered in dense, fine, grayish white hair, crinkled, thickened, elongated ovate-triangular in shape with a heart-shaped base, and only moderately narrow. The stems are upright to leaning, hairy, and relatively thick. When compared to the other common globemallows found here, this plant has a grayer, rougher, cruder, more stiff-looking appearance. 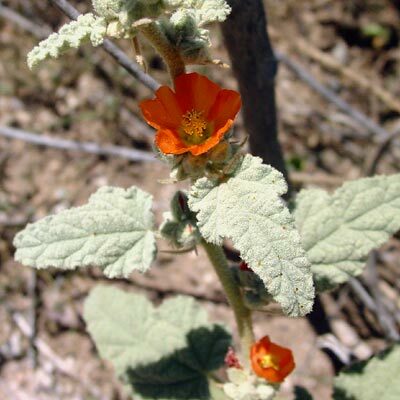 The similar Desert Globemallow (Sphaeralcea ambigua) has thinner, broader, greener, scalloped and ruffled leaves, Fendler's Globemallow (Sphaeralcea fendleri) has narrower, uncrinkled, green leaves and flowers with uncupped petals, and Caliche Globemallow (Sphaeralcea laxa) has flowers with dark maroon anthers and more delicate, uncrinkled, green leaves.